Hi, In this post we have looking for discuss topic on Jquery Datatables, How can we perform date range search on Datatables that means we will filter data between two given date and filter Datatables data based on between two given data. Here we will use Jquery Datatables and Ajax as front end operation and for back end we will use PHP script. If you have use Datatables in your project then you have get features like sorting of table column data, searching of table data, pagination and many more other feature without writing any line of code but if you want to perform date range search then this type of functionality you can not find in Jquery Datatables plugin. So for perform Date range search on Datatables data then you have to write some extra code at back end. Datatables is a widely used Jquery plugin for displaying data in tabular format and in this you can get build in feature and most of the programmer is used this plugin for displayed data in tabular format on browser and it is very easy to implement in our project. In this plugin you can get client side date range filter but you cannot find server side processing of date range search filter. 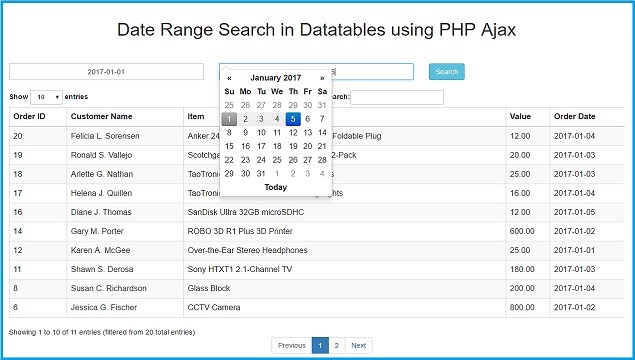 So in this post we have discuss how to make date range server side search filter by using PHP script with Jquery Ajax. Amazing lesson and project I have ever seen! I am thankful to You endlessly for the great job, ideas, creative projects in general! how can we export these datatable to csv.